The apartment that The David and I lived in before we moved into the new house had no outdoor space, unless you count the driveway. Which sometimes, did count, as we grilled burgers on a hibachi that we had to move out of the way whenever anyone needed to come through. We fantasized about our one-day-ability to lounge idly outdoors, on the veranda, sipping our mint juleps. The backyard is largely covered in concrete, a practice we’ve been told was common amongst the Italian folk who used to largely populate the neighborhood. Even the little square of grass (luscious and bright green when we moved in, now crispy and yellow) was actually just turf over broken up concrete where there used to be a garage or some other outbuilding. But it was sunny and it was ours and we would grow all the things. Enthusiasm was had. Knowledge was not. 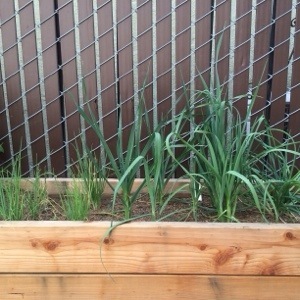 We hired a lady who helped The David to build a humongous raised planter. We paid someone $600 for a huge pile of organic dirt. The David’s assertions that we would be saving so much money by growing our own vegetables, dashed. 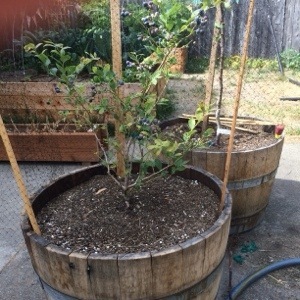 We bought a bunch of fruit trees, some to go in half wine barrels, some to fit into the few non-concrete spots of ground, so that there are now 7* different types. *See the list of failures. Seeds and seedlings were planted. Things ensued. Beseeching and more water could not save some plants. *Several bits have totally failed. 1. An herb box of mint was doing amazingly, until one day, it all started to shrivel up and crap out. 2. 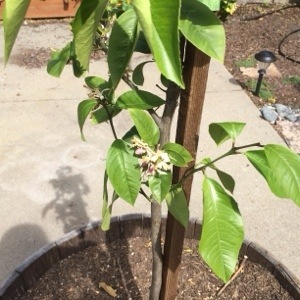 The avocado tree was always the slowest developing of the fruit trees, and then its lackluster performance went from disappointing to dead. Some kind of root rot tragedy. 3. 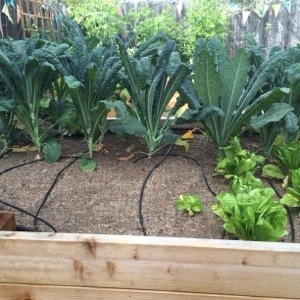 Baby lettuces got picked at by birds. We covered them with jars. Genius! 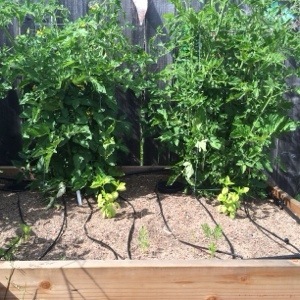 Lettuces were saved and starting to thrive. One day it got very hot. The lettuces were steamed. 4. 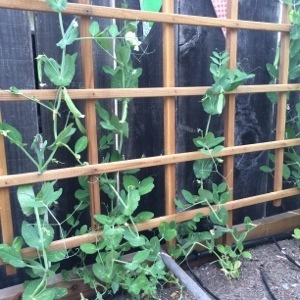 The melon seeds we planted were really reluctant to sprout and the few that did sprout are now seemingly disinterested in additional growth. 5. 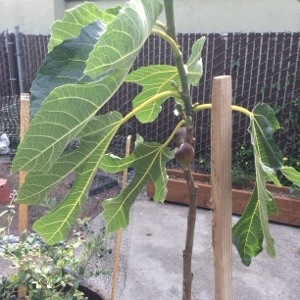 A tree specialist came out and told The David that the fruit trees were planted too deep and they needed to have the root balls closer to the surface. He dug them all up and now the pluot, who had been glorious winner of all tree awesomeness, is now droop pooper sad. Will possibly recover for next year. And that’s where we’re at. We’ve eaten a handful of blueberries and have started using our own kale in our morning smoothie habit. 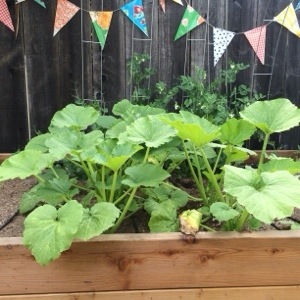 I suspect a glut of zucchini is imminent. The tomatoes appear to be growing over the fence and planning an uprising. In the mean time, there has been some idle outdoor sitting. Although due to failure #1, our outdoor sitting does not include minty cocktails. 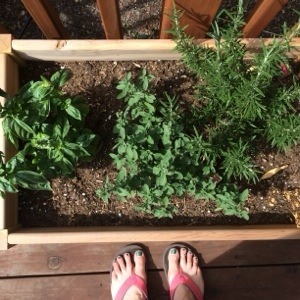 Tagged as "backyard garden", "urban homestead"